61 Cygni was christened the "Flying Star" in 1792 by Giuseppe Piazzi (1746-1826) for its unusually large proper motion. This binary system is located about 11.4 light-years (ly) away from our Sun, Sol, in the south central part (21:08:52.1+38:56:51:D~, ICRS 2000.0) of Constellation Cygnus, the Swan -- southeast of Sadr (Gamma Cygni) and east of the open star clusters M 29 and NGC 6871, and the Crescent Nebula (NGC 6888). It is the title member of the 61 Cygni stellar moving group (Olin Jeuck Eggen, 1958; and Benjamin Boss, 1911). Due to 61 Cygni AB's proximity to Sol, the system has been an object of high interest among astronomers. Stars A and B have been selected as "Tier 1" target stars for NASA's optical Space Interferometry Mission (SIM). 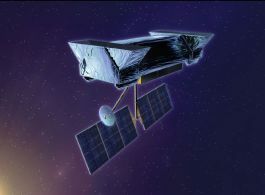 The mission will attempt to detect planets as small as three Earth-masses within two AUs of each star. Although some summary system information and images of Star A and Star B may still be available from the SIM Teams, the SIM project manager announced on November 8, 2010 that the mission was indefinitely postponed due to withdrawal of NASA funding. In 1830, Friedrich Georg Wilhelm von Struve (1793-1864) made the first measurements of the star as a binary system. It is now known that 61 Cygni A and B orbit each other at an "average" distance (semi-major axis) of 86.4 times the Earth-Sun distance, or about 86 astronomical units (AUs) -- which is more than twice Pluto's orbital distance in the Solar System. 61 Cygni was the first star system (other than the Sun) to have its distance to Earth successfully calculated by Friedrich Wilhelm Bessel (1784-1846) using trigonometric parallax and the diameter of the Earth's orbit around the Sun in 1838. Smaller and dimmer than Sol, the stars are barely visible with the naked eye. This star is a orange-red main sequence dwarf star of spectral and luminosity type K3.5-5.0 Ve. It probably has about 70 percent of Sol's mass (RECONS), 72 percent of its diameter (Johnson and Wright, 1983, page 699), and about 8.5 percent of its luminosity. The star system appears to be about 79 percent as enriched as Sol with elements heavier than hydrogen ("metallicity"), based on its abundance of iron. Dust has been detected around in this binary system (Backman et al, 1986; and Kuchner et al, 1998 -- in pdf). Stars A and B may be older than Sol, because they do not rotate rapidly and the system exhibits moderately high U,V,W velocities in their galactic orbital motion (Ken Croswell, 1995, pp. 253-4). 61 Cygni A seems to be a variable star. It has been given the variable star designation V1083 Cygni as well as the New Suspected Variable designation of NSV 13543. The star and its stellar companion B have a highly elliptical orbit (e= 0.40) that swings them between 51.7 and 121.0 AUs apart in an orbit that lasts about 722 years (Frederick Jerrold or "Jerry" Josties, 1980; in the Fourth Catalog of Orbits of Visual Binaries, Worley and Heintz, 1983 -- see Alcyone Software's web page on 61 Cygni). While the new Sixth Catalog of Orbits of Visual Binaries seems to have an error in its citation, the older Fifth Catalog provided orbital elements of: a=24.4", 85.2 AUs at 11.4 ly distance; P=659 years; e=0.48; and i=126° (Kiselev et al, 1997). Useful star catalogue numbers for 61 Cygni A include: V1083 Cyg, HR 8085, Gl 820 A, Hip 104214, HD 201091, BD+38 4343, SAO 70919, FK5 773, LHS 62, Struve 2758 A, NSV 13543, and ADS 14636 A. According to calculations performed for the NASA Star and Exoplanet Database, the inner edge of Star A's habitable zone could be located at around 0.385 AUs from the star, while the outer edge lies farther out at around 0.755 AUs. Accounting for infrared heating, the distance from 61 Cygni A where an Earth-type planet would be "comfortable" with liquid water is centered around only 0.57 AU -- between the orbital distances of Mercury and Venus in the Solar System. At that distance from the star, such a planet would have an orbital period of about 188 days -- just over half an Earth year. This star is a orange-red main sequence dwarf star of spectral and luminosity type K4.7-7.0 Ve. This star probably has about 63 percent of Sol's mass (RECONS), 67 percent of its diameter (Johnson and Wright, 1983, page 699), and about 3.9 percent of its luminosity. Dust has also been found around this star, which appears to be a variable and has been given the New Suspected Variable designation NSV 13546. Useful star catalogue numbers for 61 Cygni B include: HR 8086, Gl 820 B, Hip 104217, HD 201092, BD+38 4344, LHS 63, Struve 2758 B, and ADS 14636 B. According to calculations performed for the NASA Star and Exoplanet Database, the inner edge of Star B's habitable zone could be located at around 0.315 AUs from the star, while the outer edge lies farther out at around 0.617 AUs. Accounting for infrared heating, the distance from 61 Cygni B where an Earth-type planet would be "comfortable" with liquid water is centered around only 0.466 AU -- -- between the orbital distances of Mercury and Venus in the Solar System. At that distance from the star, such a planet would have an orbital period of about 146 days -- just over 40 percent of an Earth year. In 1942, Kaj Aage Gunnar Strand (1907-2000; obit) -- who later became scientific director of the U.S. Naval Observatory -- used photographic observations from Potsdam, Lick, and Sproul observatories to detect small systematic variations in the way that 61 Cygni A and B orbit each other, which suggested that there was a third, unseen body orbiting 61 Cygni A (Strand, 1943). In an article for the February 1957 issue of the Astronomical Journal (Strand, 1957), Strand analyzed more data and reported that the object appeared to have a mass about eight times that of Jupiter. Its orbital period was calculated to be 4.8 years which suggested an "average" orbital distance (semi-major axis) from 61 Cygni A of about 2.4 AUs -- around the inner side of the main asteroid belt in the Solar System. Despite its low mass, and a calculated diameter of less than one-tenth of Sol's, this unconfirmed third member of the system was often referred to as "61 Cygni C."
In 1978, however, Wulff Dieter Heintz (1930-2006; obit) reported on his failure to find evidence that supports the existence of an object below six percent of Sol's mass -- about 60 Jupiter masses -- in the 61 Cygni system (Heintz, 1978). Heintz found that the strength of later data suggests that the earlier results were "spurious." According to the Yale Bright Star Catalogue, 1991 5th Revised Edition notes entry for HR 8085, later astrometric measures suggested the existence of three invisible companions with orbital periods of six, seven, and 12 years. However, the suspected objects were not resolved with speckle interferometry. Hence, the suspected planetary companions were "not substantiated." The following star systems are located within 10 light-years of 61 Cygni AB. Up-to-date technical summaries on these stars can be found at: the Astronomiches Rechen-Institut at Heidelberg's ARICNS for Star A and Star B, the NASA Star and Exoplanet Database for A and B, and the Research Consortium on Nearby Stars (RECONS) list of the 100 Nearest Star Systems. Additional information may be available at Roger Wilcox's Internet Stellar Database. The Swan lies between Constellations Pegasus and Draco and is often shown with outstretched wings flying parallel with the Milky Way. Deneb, the tail star, along with Vega in Constellation Lyra and Altair in Constellation Aquila form the Summer Triangle. While the mythology of Constellation Cygnus is not known with certainty, the Greek myth of Leda and the Swan involves Zeus, the King of the Gods, who fell in love with Leda and ravaged her disguised as a swan. Subsequently, Leda laid an egg which bore Helen, the most beautiful woman in the world, and Castor and Pollux, the Gemini twins. For more information about the stars and objects in this constellation and an illustration, go to Christine Kronberg's Cygnus. For another illustration, see David Haworth's Cygnus.